In 1704 a bankrupt English merchant sent home the colt he had bought from Bedouin tribesmen near the ruins of Palmyra. Thomas Darley hoped this horse might be the ticket to a new life back in Yorkshire. But he turned out to be far more than that, and although Mr. Darley's Arabian never ran a race, 95% of all thoroughbreds in the world today are descended from him. 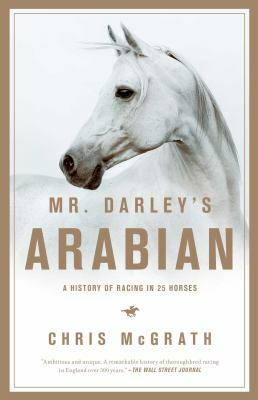 In this book, for the first time, award-winning racing writer Christopher McGrath traces this extraordinary bloodline through twenty-five generations to our greatest modern racehorse, Frankel.The story of racing is about man's relationship with horses, and Mr. Darley's Arabian also celebrates the men and women who owned, trained and traded the stallions that extended the dynasty. The great Eclipse, for instance, was bred by the Duke who foiled Bonnie Prince Charlie's invasion (with militia gathered from Wakefield races) and went on to lead the Jockey Club. But he only became a success once bought and raced by a card-sharp and brothel-keeper - the racecourse has always brought high and low life together.McGrath expertly guides us through three centuries of scandals, adventures and fortunes won and lost: our sporting life offers a fascinating view into our history. With a canvas that extends from the diamond mines of South Africa to the trenches of the Great War, and a cast ranging from Smithfield meat salesmen to the inspiration for Mr Toad, and from legendary jockeys to not one, but two disreputable Princes of Wales (and a very unamused Queen Victoria), Mr. Darley's Arabian shows us the many faces of the sport of kings.